Enzootic bovine leukosis is a viral disease of adult cattle characterized by neoplasia of lymphocytes and lymph nodes. The prevalence of infection in a herd may be high, but only a few animals develop fatal lymphosarcoma. Infection is spread by contact with contaminated blood from an infected animal. 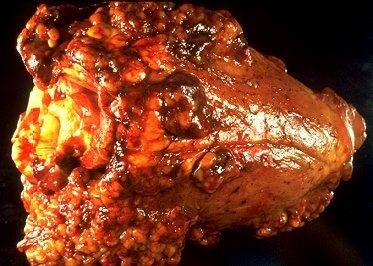 Sporadic bovine leukosis consists of juvenile, thymic, and cutaneous lymphosarcomas. These may resemble enzootic bovine leukosis, but affected animals are seronegative for bovine leukemia virus (BLV). Outbreaks of lymphosarcoma in sheep have been observed with clinical, epidemiologic, hematologic, and necropsy findings similar to those of enzootic bovine leukosis. Infection of other species with BLV has not been demonstrated. Epidemic occurrences of lymphosarcoma have been observed in pigs. Cases in horses are sporadic. Enlarged external lymph nodes on a cow with Bovine Leukemia. BLV induced tumors on the heart of a cow. Tumors from BLV are commonly found in the uterus, abomasum, heart and external lymph nodes. is characterized by multiple cases of adult, multicentric lymphosarcoma within a herd, with tumors developing rapidly in many sites and thus variable clinical signs. The usual incubation period is 4-5 yr. Persistent lymphocytosis without clinical signs occurs earlier, but rarely before 2 yr of age. Many cows remain in the preclinical stage for years, often for their complete productive lifetime, without any apparent reduction in performance. In 5-10% of clinical cases the course is peracute; often affected animals die suddenly without prior evidence of illness. Involvement of the adrenal glands, rupture of an abomasal ulcer, or an affected spleen followed by acute internal hemorrhage are known causes. In most clinical cases, the course is subacute (up to 7 days) to chronic (several months) and initiated by an unexplainable loss of body condition, anorexia, pallor, and muscular weakness. Production may drop abruptly in dairy cows. The heart rate is not increased unless the myocardium is involved, and the temperature is normal unless tumor growth is rapid and extensive, when it rises to 103-104F (39.5-40C). Once signs of clinical illness and tumor development are detectable, the course is rapid and death occurs in 2-3 wk. The superficial lymph nodes enlarge in 75-90% of cases, and this is often an early clinical finding. It is usually accompanied by small (1 cm diameter) subcutaneous lesions, often on the flanks and perineum. However, peripheral lesions may be completely absent in many cases with advanced visceral involvement. Enlargement of visceral lymph nodes is common, but this is usually subclinical unless they compress other organs such as intestine or nerves. They may be palpable on rectal examination, and special attention should be give to the deep inguinal and iliac nodes. In advanced cases, extensive spread to the peritoneum and pelvic viscera occurs, and the tumor masses are easily palpable. The enlargement may be confined to the pelvic nodes or to one or more subcutaneous nodes. Involvement of the nodes of the head is sometimes observed, often with exophthalmos. 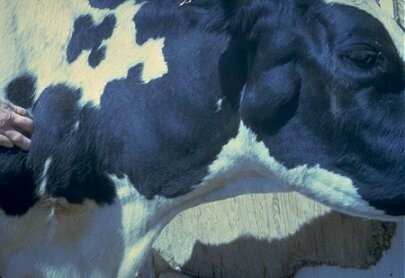 The affected nodes are smooth and resilient; in dairy cows, they are easily seen and may be marked by local edema. Occasionally, the entire body surface is covered with subcutaneous masses 5-11 cm in diameter. In addition to the lymph nodes, tissues most commonly affected include the abomasum, heart, spleen, kidneys, uterus, spinal meninges, and retrobulbar lymphatic tissue. Heart sounds are commonly muffled, and other cardiac abnormalities may be obvious. Neural lymphomatosis may lead to the gradual onset of posterior paralysis over several weeks. Because of the wide range of clinical findings, a definitive diagnosis is often difficult. Enlargement of peripheral lymph nodes without fever or lymphangitis is unusual in other diseases, except for tuberculosis, which can be differentiated by the tuberculin test. Diagnosis of the viral infection is made by serology or virology, persistent lymphocytosis is identified by hematology, and neoplastic tumors are identified by histologic examination of biopsies. Agar gel immunodiffusion (AGID) is a good screening test for identifying infected animals or herds. It has an estimated specificity of 99.8% and sensitivity of 98.5%. This test is recognized by most governments as the official standard for testing imported animals. Radioimmunoassay is useful for the detection of BLV antibodies in cattle exposed =2 wk, in milk samples, and in serum samples from periparturient dams. Serum ELISA is more sensitive than other serologic tests and may also be used on milk. The ELISA may be used for pooled serum samples and allows detection of antibodies in herds with a prevalence of <1%. The bulk tank milk ELISA is useful for identification of herds that are negative for BLV infection. Herds identified as positive by the ELISA require further testing at the individual or herd level to definitively establish their BLV status. In a control and eradication program, early detection of infected calves is difficult because colostral antibodies to BLV cannot be differentiated from antibodies resulting from natural infection. Calves that have ingested colostrum from seropositive cows usually have maternal antibodies; PCR is necessary to distinguish between infected and virus-free calves in such cases. PCR is a sensitive and specific assay for direct diagnosis of BLV infection in peripheral blood lymphocytes. The test can identify proviral DNA of BLV in the lymphocytes of neonates born to infected cows, differentiate uninfected newborn calves with colostral antibodies from BLV-infected calves, and detect the presence of the virus in the presence of antibodies. Enzootic bovine leukosis cannot be distinguished from sporadic bovine leukosis on histopathologic examination. ELISA is recommended to differentiate between enzootic and sporadic bovine leukosis because it is rapid, reliable, and sensitive. In cases in which no blood or other fluids are obtained, PCR is the most useful method for direct detection of BLV.